Just before noon, the Mermaid Sapphire lay half a mile away from the island on an ocean simmering with heat. We could smell wood smoke from a cook fire somewhere inside the thick green jungle behind the beach. We’re four degrees below the equator and as soon as the sun slides out of the sea, it starts to bake every exposed surface of our all-steel ship. When there’s no wind, the temperature soars to 86°F (30°C ) and keeps rising. The humidity rises with it. Breathing is hard work. Sweat gushes from every pore. Unprotected skin morphs into a first-degree burn. Prolonged exposure to extreme heat and humidity profoundly affects the body. Your heart rate and breathing rate increase and your core temperature climbs into the red-zone range of 40 degrees. Your blood pressure drops. You become confused and make dumb decisions. If heat stroke and hyperthermia hammer you for long enough, you become unconsciousness and die. Everyone on the ship is aware of these hazards. They wear sunglasses, sunscreen, rag scarves, and even squares of cut foam to keep the sun off their faces. They’re never far from their next drink of water. They have a mental shade-map of the main deck and move with precision from the lee of one container into the lee of another. If they can, they limit their time in the sun and whenever possible find sanctum in the cool interior of the ship. 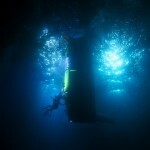 The DEEPSEA CHALLEGER lies inside an air-conditioned telescoping hanger designed by Jim and Andrew Wight. Just before the sub is launched, the hanger’s sections slide, one under the other, and expose the full length of the sub to the sun. When the sub is returned to her cradle, the hanger is extended, its main door is closed, and its 16-kilowatt air-conditioning unit is turned on. When you’re inside the hanger working on the sub, the temperature is tolerable. When you step outside, you feel like you’ve walked into a blast furnace. Among the people toiling in this unrelenting heat are the five members of the lander team: Robby Seid, David Mitchell, Larry Herbst, Erika Montague, and Doug Bartlett. Working out of one of the containers and a section of deck near the stern, they and the deck crew have prepared and deployed landers to depths of 1,000, 4,000, and 8,000 meters. On every deployment their bait trap came back relatively empty, but the last time lander Mike was hauled out of the ocean, its fishnet trap was filled with 40 pink-and-orange amphipods. They weren’t your typical, tiny amphipods; they were gigantic. 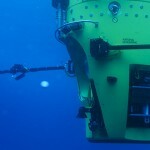 “I can’t believe it,” said professor Doug Bartlett, “It’s totally unprecedented.” Doug is a respected microbiologist from Scripps Institution of Oceanography, but knows a lot about deep-sea creatures with antennae, jaws, carapaces, and eyes. When he carefully removed the animals from the bait trap and placed them into an ice-filled cooler, they filled the palm of his hand. 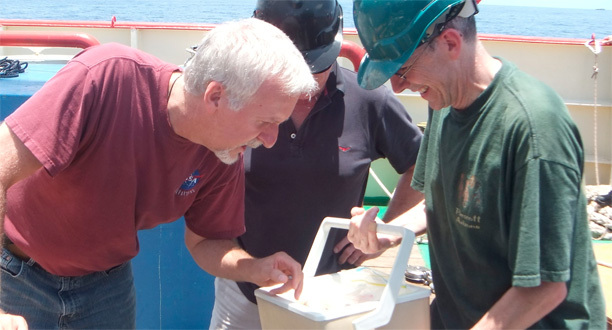 He knew he was looking at the largest amphipods ever recovered from a depth of over 26,200 feet (8,000 meters). If you want to see an authentic, million-dollar smile, look at the face of a scientist who’s just made a significant discovery. Filed under Expedition Journal and tagged science.